Start the New Year Out with New Pallet Racking! With New Year’s Day just around the corner, many companies are considering what “resolutions” they can make for themselves in the coming year. Will 2015 be your year of organization? Your year of efficiency? Your year of expansion? It can be all of those things and more with the right materials handling products, specifically, new pallet racking! Pallet racking is an absolute essential for your industrial warehouse, and buying it new can be extremely beneficial to your company. Read on to find out more! Why Should I Purchase New Pallet Racking? Pallet racking can be purchased new or used, as most materials handling products can be, but there is definitely something to be said for opting for a new set. For one thing, when you buy new pallet racking, you have more say in its design. S.W. Betz can work with you to create pallet racking that is specifically suited for your facility and that can offer you the maximum amount of functionality. This adds a whole new level of customizability to your organizational system, something that every company wants. New pallet racking has another major advantage to it: a guaranteed capacity. When you purchase newly-designed and made pallet racking, you know exactly what weight it can be expected to hold. With used pallet racking, you do not necessarily have this same guarantee, which can prove to be a safety risk if you are not careful. Safety and performance is guaranteed with new pallet racking; its load capacity is backed by both the manufacturer and the distributor. S.W. 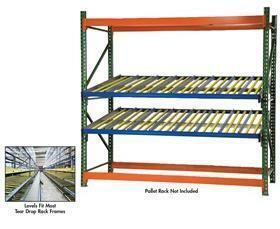 Betz carries pallet racking from some of the top manufacturers in the country, including Husky Rack and Wire. Betz can also supply you with racking accessories that can add to your organizational and efficiency goals, such as row spacers and wire decking. This New Year, be sure to look into new pallet racking to get your company on track for 2015! This entry was posted on Tuesday, December 30th, 2014 at 3:14 pm. Both comments and pings are currently closed.